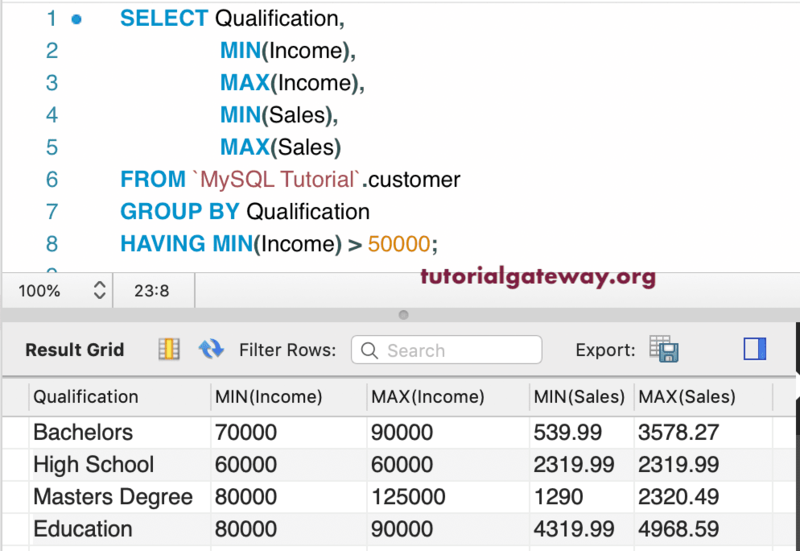 The MySQL Having Clause restrict the number of records or rows returned by the Group By Clause. 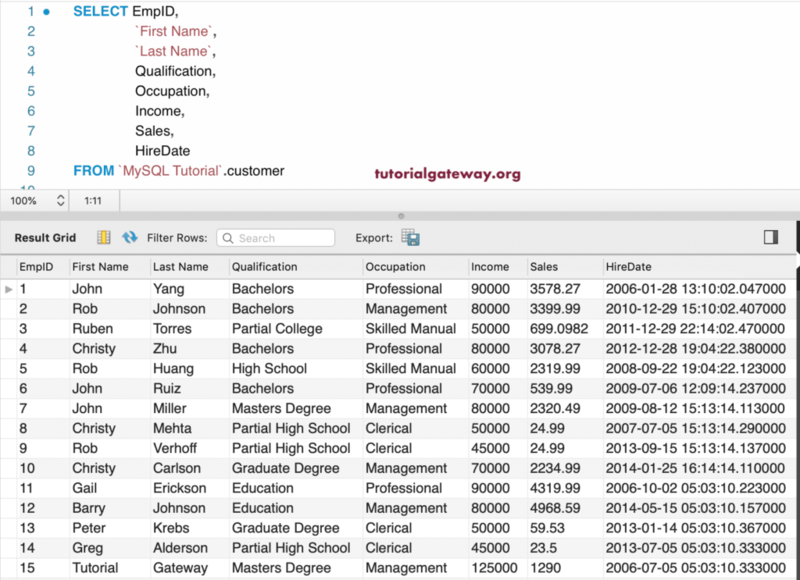 You can’t use Where Clause to check conditions against an aggregated data. For this, we have to use the MySQL Having Clause. Please refer Group By to understand the grouping. 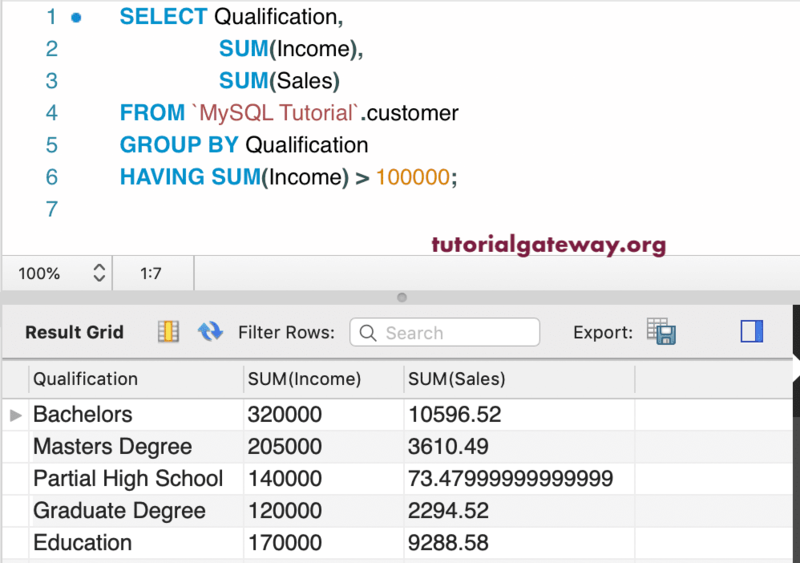 TIP: To use MySQL Having Clause, we have to use Group By Clause. Because, Having Clause is applied after the Group by clause. Group By: Columns that are not part of an Aggregate Function have to place after this Group by. Having: We can provide the Filters or apply Conditions on the Aggregated Data that we got from the Group By. 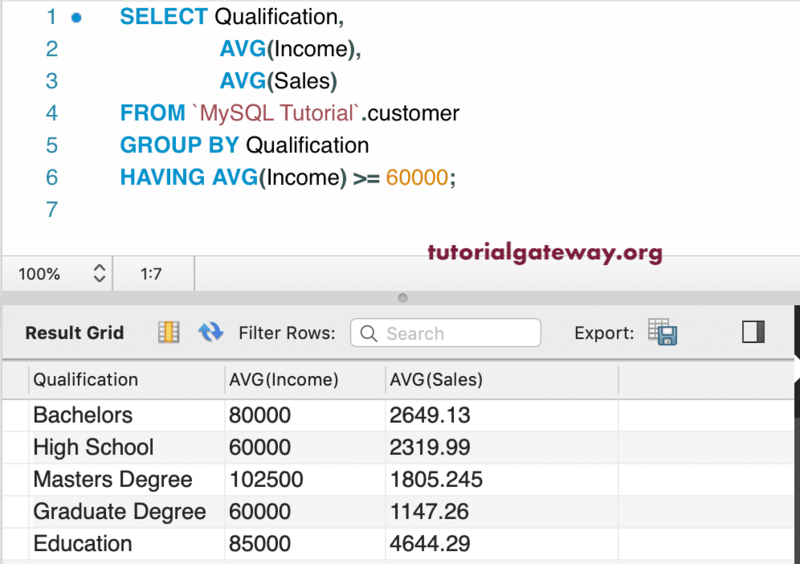 In this article, we will show you, How to use this MySQL Having Clause to filter the aggregated data. For this Having Clause demonstration, We are going to use the below-shown data. 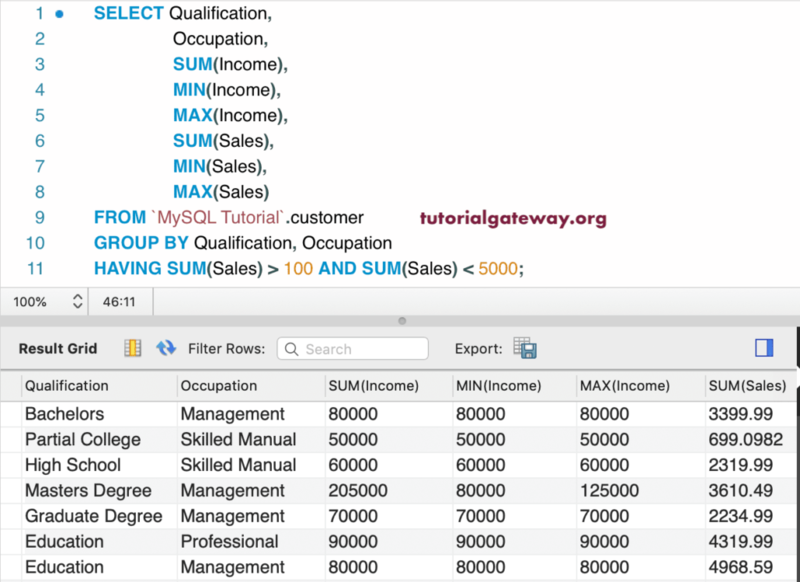 In this example, we will use a single column as the Group column, Sum function for the aggregate value. Next, we used Having clause to restrict the result. Here, Group By clause Group the customers by Qualification. Next, Having Clause check whether the Sum of Income is greater than 100000. In this example, we used the AVG function. Here, Having Clause checks whether the Average Income is greater than or equal to 60000. In this example, we used Min Function in the Having Clause. 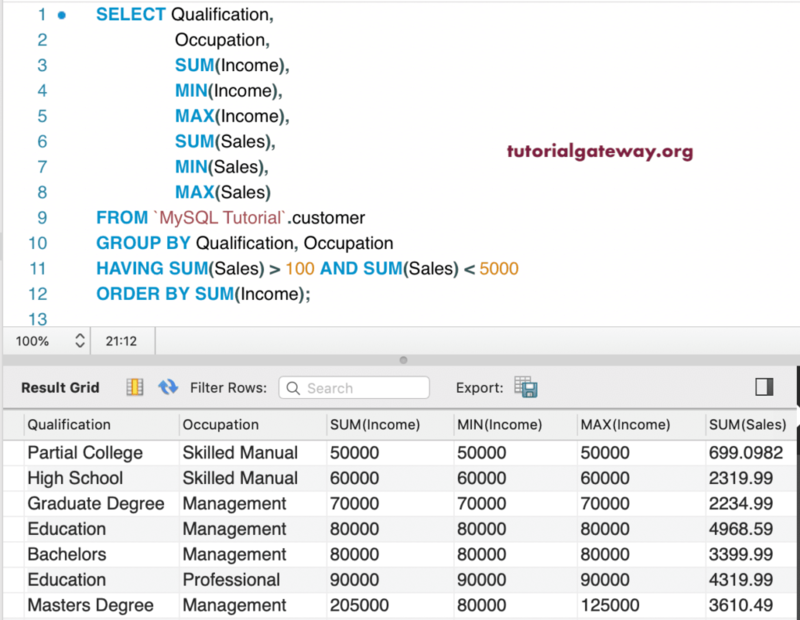 Below query returns Minimum Income, Maximum Income, Minimum Sales and maximum Sales in each Qualification whose Minimum income is greater than 50000. 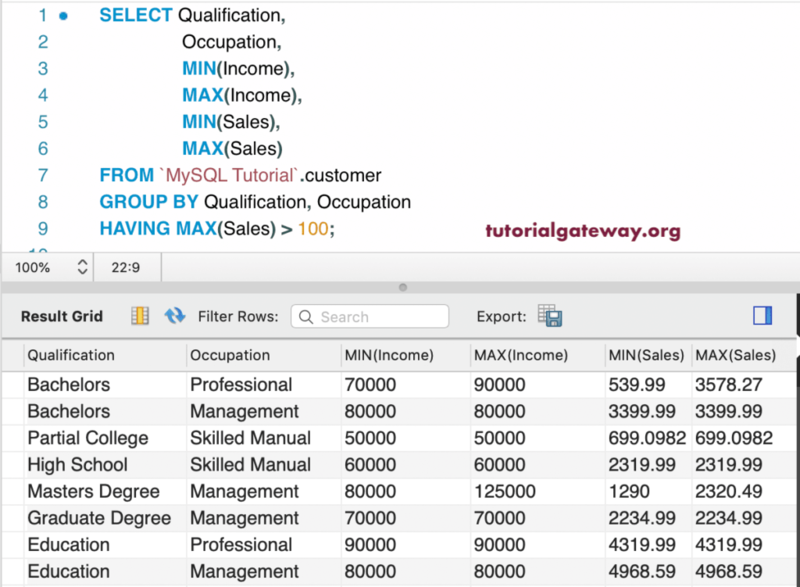 This time, we are using Multiple columns in the Group By clause. Next, we used Max function inside the Having Clause. First, Group By clause Group the customers by Qualification and Occupation. Next, Having Clause checks whether the Maximum Sales is greater than 100 in each group. In this example, we are going to use Multiple Conditions in the Having Clause. First Group By statement Groups the customers by Qualification and Occupation. Next, Having Clause check whether the sum of Sales is greater than 100 and sum of sales is less than 5000. We can also use Order By along with the Having Clause. Here, the result is sorted by Total Income in ascending order. In this Having clause example, We used the command prompt.